The difference between organizations that make it in the 21st century and those that don’t will be whether their leaders have learned new skills and adopted a completely new perspective. Today’s leaders need more than technical ability and IQ to succeed; they need emotional intelligence. Leaders will be called on to manage unending transitions, inspire others, coach, and mentor employees and to learn continuously. Donna’s skill-building program gives participants a solid grounding in the basic skills, perspective and knowledge necessary to be successful leaders in the new reality. Learn what to do with those “irregular people” you supervise…and how to know if you’ve really got one! 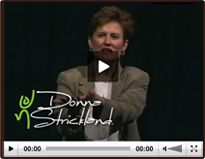 Hire Donna Strickland for a Training Program by contacting us directly at (303) 808-4880.